First, there was the popular World of Tanks. Sometime after that, World of Warplanes happened. Now, Wargaming are preparing to unleash the third in their World of WarThings series. Unless they've got a World of Wartrains in production, it could also be the last. World of Warships is currently docked for closed beta. 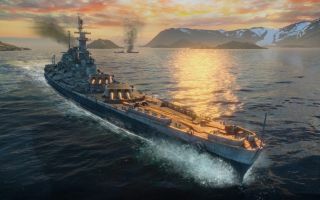 In preparation for the weekend's test, Wargaming has released a new trailer featuring in-engine footage of the game. It's not as bombastic as their CGI shorts, but it should give a more realistic sense of how the finished product will look. If you'd like to give this weekend's test a go, you can still get in on our 1,000 key competition. You have until today, at 4:30pm GMT to sign up.